We are at a very exciting point: The first sculpture is done! In fact it's already on display. And it's gorgeous. reconstructing them into art. 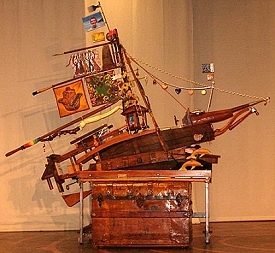 Capturing the feeling of an old-time sailing vessel, and adding his signature blend of meaning and whimsy, Monty created the basic structure of Life's Voyage from found objects in his collection: vintage chest, wine barrel slats, artist's stool, child safety gate, vintage wooden leg, broken chairs, wood tray, and coffee bean grinder. Then he added the 70 meaningful objects we received from people whose lives have been touched by cancer. The objects represent ways those people found empowerment while they or someone they loved was going through cancer. The sculpture is captivating. Seven feet tall and nine feet long, it gives the impression of gliding gracefully and purposefully through rolling seas. It even has dolphins leaping from the waves alongside the bow. More colorful and detailed than the photo above shows, every inch of the sculpture has something interesting to look at. (We'll post another photo when we can get better lighting and stand on a ladder!) Finding all the objects is a Where's Waldo? art adventure because so many objects are tucked away where you don't expect them. The website will be updated as things progress. Keep checking back so you don't miss anything! The Objects page and the Blog are good places for quick checks, as well as this page. The completed sculptures will be exhibited at a series of indoor, public places. The exhibit itinerary will be posted here. Contact us if you want to host a display of one or more sculptures. Feel free to email us with your comments. Or email your friends a link to this website. If you were given the link to this page and have not read anything about the sculpture yet, you might want to read the Sculpture Overview and the Arts for Healing Mission.